Veldeman based in Bree, Belgium, is a world player in the design, manufacturing, sales and rental of aluminum and steel framed fabric structures. The company offers turnkey solutions for temporary and (semi-)permanent use in a variety of industries: sports buildings and indoor training facilities, tents and marquees for all sorts of events and fabric structures for retail and logistics. Veldeman has its own R&D and engineering department, a dedicated project business unit, an in-house fabric and metal department and its own maintenance department. 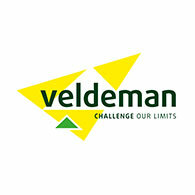 Next to the Belgian headquarters in Bree, Veldeman has a branch in the US, in Chile and in Australia. Founded in 1970, the company has over 45 years of experience with fabric structures. Veldeman’s (semi-)permanent sports buildings feature a high quality PVC membrane tensioned over an aluminum or steel frame. The strengths of this system include rapid construction, low life cycle costs, flexibility of design and superior performance. In general, these cost-effective, large span sports buildings cost approximately 40% less than traditional buildings. Besides semi-permanent sports buildings, Veldeman offers temporary structures for hospitality. From the smallest party tent to the biggest construction, with a pyramid roof, curved roof or A-shaped roof, with a floor, windows, doors or other accessories: Veldeman has a unique covered solution for every event.